A large visitor to Port Nelson this week, the car carrier Trans Future 5. Last Weekend Nelson hosted the NZ celebrations for Mazda's 20th Year Anniversary of the production of this beaut car, the MX5. Everywhere you looked last weekend you couldn't help but spot one. An unusual sight at Nelson Airport yesterday. Has "Aero Vodochody - L39C - Albatros" written on the side of the outer wing fuel tank. UPDATE - local paper has story about it here. 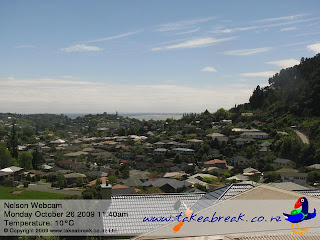 Today is a bit of a cheat day - I haven't taken these pics myself, but have "borrowed" them from Takeabreak NZ's webcams sprinkled around Nelson. 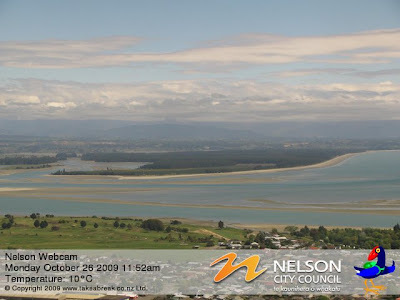 Above image is from Takeabreak NZ's webcam located in Bishopdale, Nelson. The webcam, here, looks out in a northerly direction. 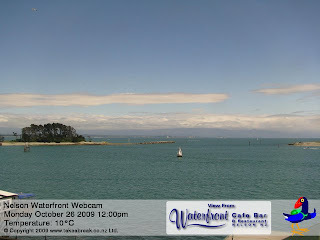 And here above is a snap taken today from the unit located at the Waterfront Cafe & Bar on Wakefield Quay. 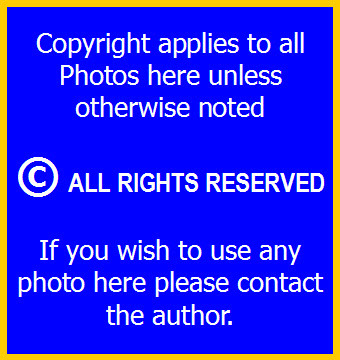 This camera is looking out in a West North Westerly direction. 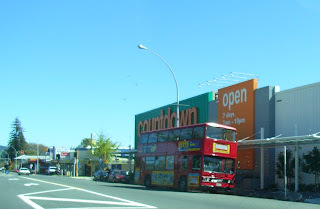 And this last one is from high on Princes Drive Nelson. If you'd like to see its exact orientation to get your bearings for its Nelson location / outlook, head on over to my post in which I've done just that. 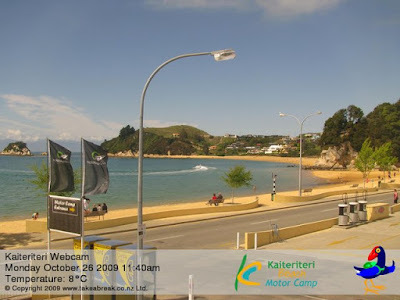 And lastly who can forget seeing the Golden Sands of Kaiteriteri for the first time. For many honeymooners from the baby boomer years this sight will bring back fond memories of a different time & place.....along with a different pace of life. This webcam's outlook is in a east south easterly direction. Looking out over the Nelson Airport you can see the Kina Peninsula outlined fabulously by a low setting sun. Motueka lies about middle of screen far right hand side. Grampain Oaks is one of Nelson's newer suburbs as can be evidenced by the new builds you can see. The Grampians behind, make a fabulous backdrop / outlook for local residents. From memory most of these sections are already sold. Everyone in Nelson knows about the Railway Reserve, its a path that leads from town out through Richmond and onto Brightwater. Its a throwback to when Nelson did have a train-line and a service. But that was many years ago, and now's its just a favoured pedestrian and cycleway to get around. Just recently the stretch you can view here was sealed. Well known Nelson tourist attraction Founders Park with its windmill. When it turns to Spring and Summer in Nelson you see a bit more of this old fellow around the town. On track in 2009 we are to win! according to last nights paper we are 75 hours ahead in the sunshine stakes as compared to Blenheim / Marlborough. So the weather chart above is no surprise. This time of year around Oct / Nov the Frost Fighters as they are called are out there. Vineyards stand to have damaged crops when unseasonally late frosts turn up. The way to combat this is with choppers. Nelson landed in Stoke here as the plague indicates. 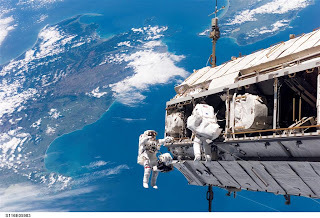 seen this famous image before, it was taken on a previous Shuttle mission, 116 anyone? and shows a fab background of the Top of the South. That's Nelson in the "V" of Tasman Bay just to the left of top centre of pic.